I recently bought myself a new pair of cowboy boots and I never want to take them off, thus kicking off my western wear search! 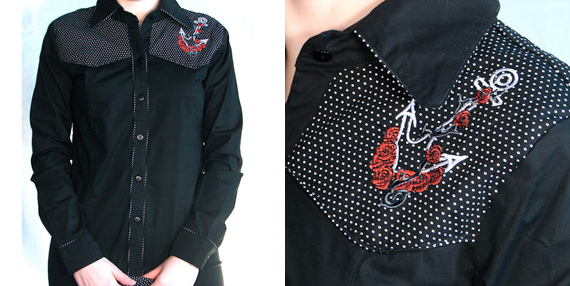 Even if you’re not into line dancing or dosey doeing at your local country western bar, you can’t deny how adorable the Howdy Sailor Shirt by Living Dead Souls is. This shirt’s yoke is polka dot and features an embroidered anchor and rose detail, combining all the good aspects of western and sailor styling. The Howdy Sailor Shirt can be worn with the sleeves rolled up for a spring day, paired with some denim and of course a lovely pair of cowboy boots! Yeeeee-haw! The Howdy Sailor Shirt is available online at www.catslikeus.com.